If you have oily skin, you may have noticed that foundation tends to break down or smudge easily. These is because oil dissolves makeup. Hence, you want to look for the best cushion foundation for oily skin that lasts the whole day and keeps your skin feeling matte and fresh. Cushion foundations are a huge hit especially in South Korea because they are portable which allow you to easily touch up your foundation. 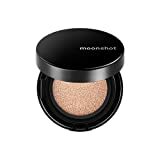 Many people also love cushion foundations as they usually have sunscreen in them, so reapplication of sunscreen throughout the day is a breeze by using a cushion foundation. No longer do you need to fuss over sunscreen reapplication over makeup. 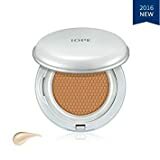 Iope Air Cushion Matte Longwear Foundation is a cushion foundation you can consider if you do not want a cushion foundation that looks dewy or matte. This cushion foundation provides a semi-matte finish which feels comfortable on the skin as it is not oily yet not drying. IOPE cushion foundations are very popular because they make the skin look really FLAWLESS. The coverage is medium to full depending on how many layers of foundation you apply. You can easily layer on more foundation without looking cakey because each layer blends seemlessly. Nobody would be able to tell that you have several layers of foundation on as the result does not look heavy. Individuals with oily skin tend to have huge pores. IOPE Air Cushion Matte Longwear Foundation does not accentuate the appearance of pores. On the contrary, the foundation fills in the pores and make your skin look so smooth and poreless. The cushion foundation is resistant to sweat and sebum so it lasts really long. Laneige BB Cushion Pore Control is a cult favorite cushion foundation. 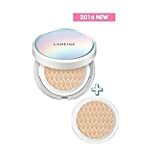 It provides a semi-matte finish so it is ideal if you want a cushion foundation that is suitable for oily skin but is not drying either. 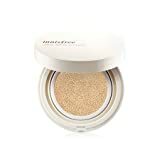 This cushion foundation has a very good lasting power as it is sebum-resistant and water-resistant. This cushion foundation would last for at least 8 hours on your skin. Due to its lightweight texture, oily skin individuals would find this foundation to be comfortable on their skin. It also does not have a tendency to be cakey or accentuate dryness as it does not have an incredibly matte finish. It provides a medium to full coverage so you can skip concealer if your skin flaws are not too severe. In addition, the cooling sensation will make you feel refreshed on a hot day. Moonshot Microfit Cushion is also known as the G-Dragon Cushion. For those who are in the dark, G-Dragon is a very popular K-pop star in the famous boy band, Big Bang. While the marketing tactic of using a famous K-pop star may seem like a cheap attempt to sell a non-high quality product to K-pop fans, let me assure you that this cushion foundation is really good and would exceed your expectations. This product feels incredibly lightweight and fresh yet the coverage is pretty good! It provides a medium to full coverage and the coverage is buildable without looking cakey. It also does not emphasize the appearance of large pores as it fills in the pores and give you a smooth appearance like an egg. The finish is semi-matte and not sticky so it is not oily but also does not dry out the skin. The foundation lasts the whole day so you might not even need to touch up! The Face Shop Oil Control Water Cushion is an ideal cushion foundation if you want a matte finish. It is sebum-resistant and water-resistant so it has good lasting power. This cushion foundation has good oil-control properties so you would not need to blot your skin throughout the day. It does not have a sticky finish so you would not have hair sticking to your face. It is perfect for oily skin individuals who want to feel comfortable all day. 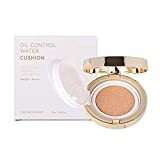 The Face Shop Oil Control Water Cushion provides a light to medium coverage which is ideal for those with relatively good skin or minimal skin flaws. If your skin is very oily and you would like to have a cushion foundation with a very matte finish, then you should go with the Innisfree Long Wear Cushion. Innisfree Long Wear Cushion is very good at controlling sebum so you do not need to blot your skin throughout the day. In addition, it feels cooling on the skin which is a bonus for the hot weather. This cushion does indeed last long as it is resistant against sweat and sebum. Therefore, you would not need to touch up often. As Innisfree Long Wear Cushion feels lightweight, those with oily skin will not feel suffocated or greasy with this product on their faces. The coverage provided is light to medium.